Updated at 5:35 p.m. on Monday, June 18, 2018 with funeral information. Claude Ramsey, who rose from third-generation Hamilton County strawberry farmer to deputy governor of Tennessee, died Monday at the age of 75. In more than 40 years of public service, he was elected five times as county mayor, four times as assessor of property, twice to the Tennessee General Assembly and once as county commissioner. Ramsey never lost an election. As county mayor, the Republican was credited as playing key roles in acquiring the former Volunteer Army Ammunition Plant for redevelopment as Enterprise South, landing Volkswagen at the site and in developing the Tennessee Riverpark. Months after Ramsey won his fifth term as county mayor in 2010 with 77 percent of the vote, new Gov. Bill Haslam tapped him for the post of deputy to the governor. When he retired in August 2013, after serving longer than the two years he'd agreed to, the governor said the Harrison native had played an integral role in civil service reform, economic development and workforce development training. He called him a "smart, wise counselor who is great at working out problems." After he retired, he opened River Branch Strategies, a government relations firm, in 2015. Ramsey began his 40-plus-year public service career in 1972, when he scored an upset win for a state House seat over incumbent Laban DeFriese. After two terms, he ran for and won a seat as a delegate on the state's last constitutional convention in 1977, which revamped Tennessee's county government structure from a county court system to the current commission system. In 1978, a very down year for his party, Ramsey was the only Republican elected to the nine-member Hamilton County Council (now commission). He resigned after being elected assessor of property in 1980, where he served until being elected county executive, now mayor, in 1994. He also had been a charter member of the Chattanooga-Hamilton County Hospital Authority, president of the County Officials Association of Tennessee, a member of the State Board of Equalization and the Local Government Planning Advisory Committee (both under then-Gov. Lamar Alexander), charter president of the Harrison Jaycees and chairman of the Harrison Community Council. Through the years, Ramsey was given numerous honors, including Chattanooga Area Manager of the Year, Outstanding Legislator by the Southern Health Association, Outstanding Man of the Year by the Signal Mountain and Harrison Jaycees, and Hamilton County Young Farmer of the Year by the Chattanooga Jaycees. As word of Ramsey's death spread Monday, lawmakers and community leaders expressed their condolences and shared memories of Ramsey's impact. U.S. Sen. Bob Corker, R-Tenn., described Ramsey as "dedicated, prudent, humble and wise." "These are the leadership qualities with which Claude Ramsey led our county," Corker said in a statement. "When I was elected mayor of Chattanooga, I had the privilege of becoming his partner, particularly as it related to economic development. During that time, I especially loved our early morning phone calls to discuss how to execute our community's shared vision. I spoke with him again by phone last Thursday and shared with him not only what an honor it was to work with him over the years but also how grateful I have been to call him a true friend. My heart goes out to Jan and the entire Ramsey family during this difficult time." State Sen. Bo Watson, of Hixson, called Ramsey "a giant in the community." "Dating all the way back to the early '70s he has been a part of the political and governmental fabric of this county, and much of the progress that we have made in Hamilton County is due to the unselfish work of Claude Ramsey," he told the Times Free Press on Monday. "His contributions to our community are just immeasurable. "He once told me, 'Never forget to ask someone for their vote.' Even though Claude was an incredible political force, he never took any election for granted. If people ran against him, he ran to win." Hamilton County Mayor Jim Coppinger also mourned Ramsey's death, saying, "Today is a sad day for Hamilton County." "We lost one of our iconic figures — an individual that contributed not only to Hamilton County's success, but also the state of Tennessee with his service," he added. "I think of Claude Ramsey as a person that exemplifies what public service is about. He always made it about the people. "There was never a controversy about him because he lived his life with the expectations of elevating what public service should be," Coppinger said. "He did it with such class. He brought to his public service that particular style that resonated with the public, so people therefore were very receptive of the decisions that he would make." The family will receive friends Wednesday from 4 to 8 p.m. at Heritage Funeral Home, 7454 E. Brainerd Road. The funeral will be at 2 p.m. Thursday at Bayside Baptist Church, and the family will receive friends before the service from noon until 2 p.m.
A private graveside service will take place in Hamilton Memorial Gardens. "Claude Ramsey made economic development and education our priorities and put practicality over partisanship. Even as they mourn him, I know his family will be proud of his legacy," Mayor Andy Berke said in a statement. "I am deeply saddened by the loss of my friend and mentor Claude Ramsey. Across the state, Claude was known as a true civil servant beginning his career in 1972 when he was elected to the Tennessee General Assembly, to his incredible service to Tennessee's Third District as mayor of Hamilton County among other roles, and statewide as deputy to the governor. Claude was instrumental in the promotion of business in Tennessee using his expertise to form local, state, and federal partnerships that will continue to benefit our great state for years to come. It was an honor and a pleasure to know Claude Ramsey, and there is no doubt that he will be missed dearly by many. I send my condolences to his family and friends during this difficult time," Congressman Chuck Fleischmann said in a statement. "Tennessee has lost one of its finest statesmen and Crissy and I have lost someone that we loved and admired. Claude loved Hamilton County and the state of Tennessee and his service was always marked by a strong desire to do the right thing. He was also one of the most enjoyable people to work with that I have ever known. Crissy and I send our love and sympathy to Jan and his family," Gov. Bill Haslam said in a statement. 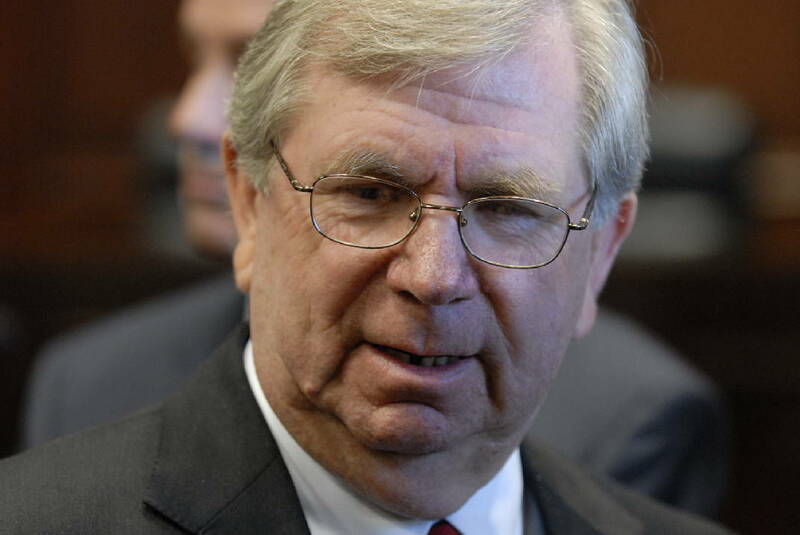 "Claude Ramsey was the living definition of what it means to be a public servant," said House Minority Leader Craig Fitzhugh. "He was a driving force in Chattanooga and Hamilton County. Without Claude's vision and steadying hand, I do not believe that Volkswagen would be in Chattanooga. I enjoyed working with him in his role as Deputy Governor. He was a great advocate for his hometown and for our state, and was a gentleman—giving his courteous attention to any person, of any party, of any stature. His example of leadership will live on, and his family is in my prayers." Claude Ramsey was my friend and coworker in government for decades. When opportunity knocked for significant economic gains during our respective terms as mayors, I could not have asked for a better partner. With the support of long term staff at the city and county, we were able to work together seamlessly. He was a man of true integrity and reliability, a great traveling companion and keeper of a rare wit and wisdom. I shall miss him like a member of my own family," former Chattanooga mayor Ron Littlefield said. "Claude Ramsey has served all of Hamilton County with distinction. His leadership as a Republican has been critical to the majorities held by our Party and the conservative growth in this area," Marsha Yessick, Hamilton County GOP Chairman, said. "The local GOP offers its sincerest prayers and condolences to Jan and the entire family with their loss. Claude Ramsey's legacy will remain for generations as the foundation for our great community."